The Academy for Lifetime Learning is an all-volunteer organization of men and women who share their interests and life experiences to provide a rich and varied menu of courses. Sign up for membership by paying the $25 per semester enrollment fee. Members are free to choose as many courses as they like, but please read the schedule carefully as class schedules often overlap. Register early, as classes fill up quickly. You will be notified by e-mail that you are enrolled. If a course that you want to take is full, you can sign up for a wait list. If you register and then find you cannot attend, please let the instructor know so another member can take your place. You can register here or by mail. Any class fees assessed by the instructor are payable directly to the instructor on the first day of class. You can browse through the courses below or download a PDF of the course descriptions here. Thanks for your interest in the Academy for Lifetime Learning. Theatre: Let’s Put on a Show! If you ever wanted to learn about the game of golf, here is a very affordable way to get into the game. A series of workshop/clinics, conducted at the Eastern Shore Yacht and Country Club (ESYCC), will cover both classroom and on-course instruction. Golf clubs will be made available for those who do not have their own. Although the golf club recently suffered the major loss of its clubhouse, all golfing activities are available and will continue. Golf is a great way to spend some time outdoors, alone or with friends. Here on the Shore the weather makes it an activity you can enjoy the majority of the year. The course is offered in two phases, Golf 101 and Golf 102. Each comprises six sessions. One can take the two courses in succession as one follows the other. This approach permits new golfers to decide whether golf is for them before having to commit to more than just the six sessions of Golf 101; it also permits those who may have some golf experience to pick up the game again by just joining the Golf 102 program. Instruction, in no particular order, will cover: objectives of the game; basic rules and etiquette; equipment; proper club grip; proper set-up over the ball; golf club swings for drives, pitches, and chips. Instruction will go back and forth among the classroom, the driving range, the putting green, and eventually the course itself, and the order of things will partly depend on weather conditions. For any play on the course, carts will be provided. While using club facilities, participants are asked to observe the same club rules as members. Instruction will be in a relaxed atmosphere, the learning experience will be fun, and hopefully weather conditions will be favorable! If the weather is too inclement to hold a session, rain dates will be arranged with the participants. Lunch service will be available at ESYCC following each session. Location: Eastern Shore Yacht & Country Club, end of Country Club Road, Melfa, VA. Cost: $89 for Golf 101 or Golf 102, payable at the first class. This includes use of the range for the course itself. Unlimited use of range during the six-week session is only $20 more. ESYCC Personnel: Alan Moore is a certified Class A PGA instructor and will conduct the program. 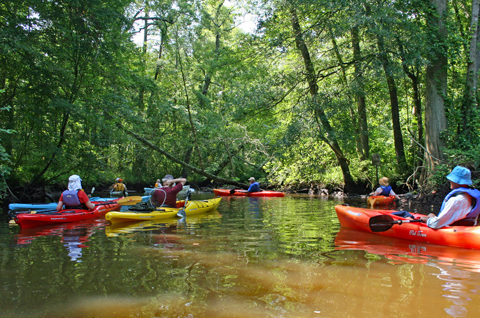 Paddlers of novice ability can enjoy a delightful day on Dividing Creek and the Pocomoke River. Learn river paddling; planning; paddling techniques; safe boat handling; and nature observation in a cypress-flanked blackwater river. We will be paddling with the tide the entire way. There will be no whitewater or rapids, and half of the paddling will be done within the sheltered confines of Dividing Creek, a tributary of the Pocomoke River. The pace will be leisurely, and we expect to be on the water for three to four hours, returning to our starting point at the Winter Quarters boat launch (a 5-mile trip). A peaceful afternoon spent kayaking is one of the most pleasant ways to enjoy the natural beauty of the Eastern Shore. The highlight will be paddling through a scenic bald cypress-black gum swamp. These beautiful and tranquil tannin-stained waterways are home to an abundant array of wildlife and native plants, including many species of orchids and warblers. One session: Wednesday, May 15, 11:30 a.m.-4:00 p.m.; rain date, Thursday, May 16. Location: Class will meet at Winter Quarters Boat Ramp at 11:30 a.m. The ramp is accessed off Winter Quarters Road (first right on northbound Rt. 13 after Lowe’s in Pocomoke). We will unload boats and gear to be on the water as close to noon as possible. We will paddle up the Pocomoke River with the tide and then continue up Dividing Creek. We will take a snack break and then after the tide turns, we will paddle back to the Winter Quarters ramp. Afterward, those who wish can gather locally for dinner and refreshments. * A general liability waiver form must be signed to participate. * The distance to be traveled is approximately 5 miles. While this is not a difficult outing for most individuals, if you have health issues, you should probably not participate. Please discuss concerns with leaders in advance. * Bring a kayak, borrow one from Ken and Sandy, or rent one in Snow Hill from Pocomoke River Canoe Company (pocomokerivercanoe.com). Arrangments to transport your kayak can be made. * Participants must wear a life jacket (PFD) while paddling. * Wear appropriate outdoor clothing. Bring insect repellent, sunscreen, snacks, and water, and perhaps a camera and binoculars. Class fees: The class is free to A.L.L. students. Rates for kayak or canoe rental is extra. General Liability Waiver Form: You may not participate until the signed form is handed in to Ken and Sandy. You can access the form here. Download, read, complete all yellow highlighted areas, and bring the completed form to class with you. If you cannot download the form to complete it, read it online and be ready to sign a copy that you will be given upon arrival at class. Ken and Sandy will coordinate meeting locations, carpooling, post-paddling activities, and paddling equipment needs, and will contact participants by email before the trip. This is their ninth A.L.L. kayaking trip. They’ve led many paddling adventures locally, in New York, and in Pennsylvania. Sandy is a co-creator and coordinator of The Delaware River Sojourn, an 80-100 person week-long paddling/camping journey now in its 25th year. Is the glass you see half full or half empty? Learning to think positively can help you lead a happier life. 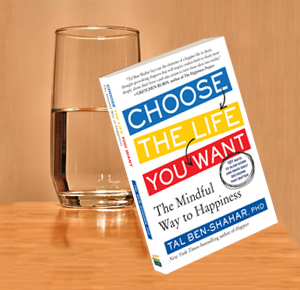 Using the book Choose the Life You Want, by Tal Ben-Sharar, we will explore the ideas of positive psychology which may help us enjoy a happier life. Dr. Ben-Sharar is the Harvard professor who introduced the most popular course in the university’s history. Location: Peggy’s home near Onancock. Directions will be given to participants. Peggy Swan is a Licensed Professional Counselor and a Licensed Marriage and Family Counselor in Virginia. She enjoys learning about new ideas in psychology, particularly “positive psychology” and the effect of natural surroundings on our mental and physical well-being. This class will cover making scenery for model railroads, dioramas, or miniature realistic display units. It will cover base construction, landscaping using purchased or natural local materials, building structures (model RR sizes from N scale to G scale or Half-scale for miniaturists) and weathering these structures. The class will incorporate your design needs. Students from a previous semester’s class took time out from working on their scenery module to display their work-in- progress. Participants can bring their own materials. Purchasing kits will be discussed in the first class, as well as where other materials can be found. The cost depends on what participants want for their project. Some materials (paint, plaster, foam, etc.) are available at the Train Station, but there is a materials fee of $20 for non- SPOTS members. Jan Siglin has a degree in Art Education and a Master of Fine Arts degree. For many years she taught art in local high schools. This class will provide the participants an opportunity to learn new strategic games different from the class board games such as Parcheesi, Monopoly, Risk, or Trivial Pursuit. 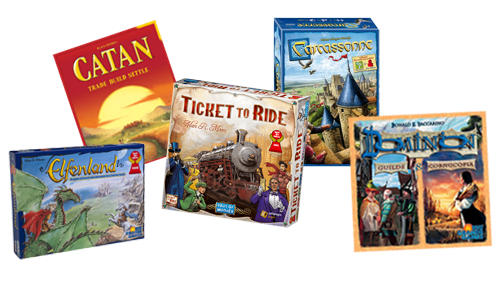 The games to be played are internationally recognized award-winning games, such as Settlers of Catan, Ticket to Ride, Elfendland, Carcassonne, and Dominion (which is technically a card game). Board games are an excellent way to socialize and to tickle the gray matter. Eight Sessions: Wednesdays March 6, 13, 20, 27, April 3, 10, 17, and 24, 1:00-4:00 p.m. Location: Carol Stowell’s home in Atlantic, VA. Directions will be sent to class participants prior to class. Carole has been a lifelong lover of board games. She has played and acquired strategy games, offered in this course, that have been played and enjoyed in American embassies and consulates over Europe. 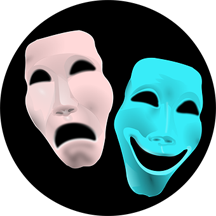 Whether it’s tragedy or comedy, theatrical productions hold up a mirror to life and allow us to experience vicariously the depth and breadth of the human condition. In this class students will participate in creating scenes, both as actors and directors, exploring the roles/jobs each has in the overall production process. They will work from a variety of scripts. No experience—or memorization—necessary! Five Sessions: Wednesdays, March 13, 20, 27, April 3, and 10, 3:30-5:00 p.m..
Terry Bliss is the founder and has been the artistic director of the North Street Playhouse since 1986. She is an actor, director, and producer. Terry Bliss has taught previous theatre courses through ALL and ESCC. 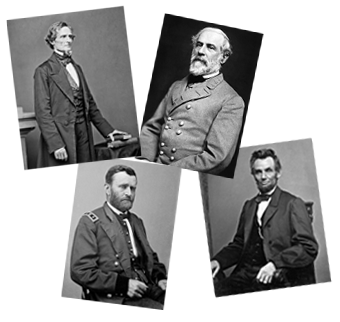 Jefferson Davis, Robert E. Lee, Ulysses S. Grant, and Abraham Lincoln—these were the paramount political and military figures in America’s Civil War, but they are only the most well known of a cast of thousands. Bob Quigley will introduce you to the “Big Four” as well as a number of the lesser known characters in the conflict. This class will be primarily a military history of the American Civil War. It will also include some of the political context the war took place in, the weapons, tactics, and attitudes of the time, as well as the cast of characters. 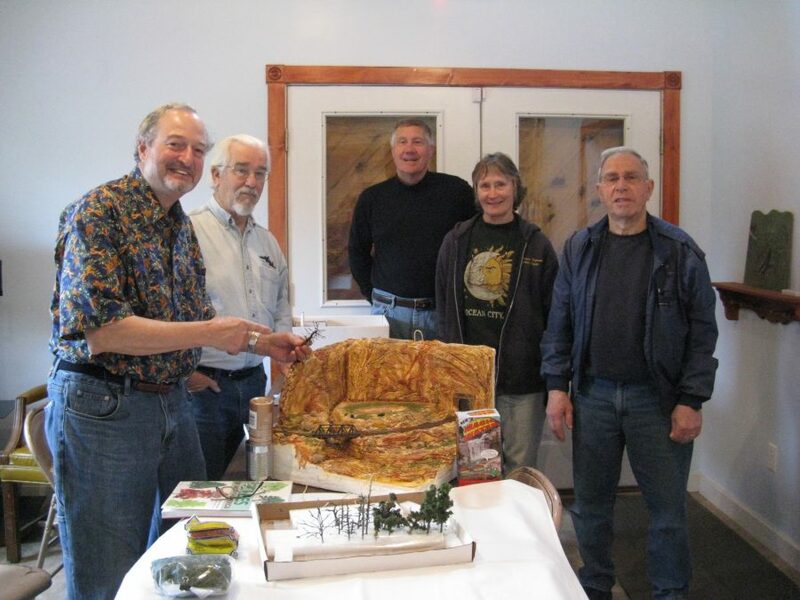 Six Sessions: Fridays, March 29, April 5, 12, 19, 26, and May 3, 2:00-3:30 p.m.
A former radio talk show host, Bob Quigley has been a student of the Civil War for 60 years and has presented courses similar to this for other groups over the years. Although not professionally trained as a historian, he has earned the respect of professionals in the field as the author of the book Civil War Spoken Here: A Dictionary of Mispronounced People, Places, and Things of the 1860’s. 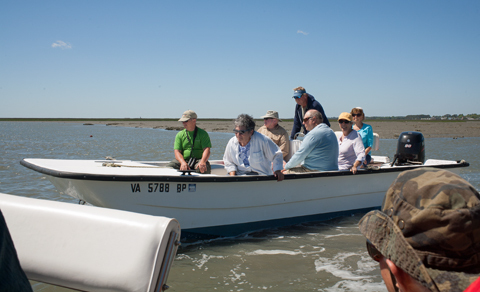 The barrier islands have played a unique part in the history and ecology of Virginia’s Eastern Shore. Learn about the history, culture, and stories of the residents of the islands. The course will incorporate guest speakers and welcome students’ artifacts and personal stories about the lore of the barrier islands. Rick Kellam is a fifth-generation Hog Islander. His career has always been connected to the water; he has been a waterman, a marine policeman, and a staff member at The Nature Conservancy. He is the only Certified Waterman’s Heritage Tour Guide on the Shore and the author of two books and many articles. He owns Broadwater Bay Ecotours. Can you figure out “who done it?” before the end of the story? Readers in the 2019 Winter-Spring course will be testing their deductive powers by trying to unravel the mysteries before they are solved by the female detective protagonists in these 74 short stories, which span 150 years of literary history. Six sessions: Fridays, March 1, 8, 15, 22, 29, and April 5,11:00 a.m.-12:30 p.m.
Sherry Burns is an avid reader, sometimes writer, and a grateful Eastern Shore retiree. There’s something almost magical about watching butterflies flutter around. Learn how to make your own butterfly hatching house so you’ll have a ready-made butterfly population for your own yard. Learn to hatch butterflies from egg to caterpillar to chrysalis to glorious butterfly. 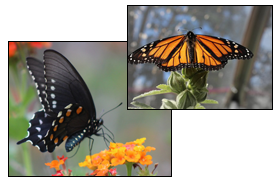 Laurice Hohlt will demonstrate how to build a butterfly hatching house and all the steps to hatching your own Monarch and Black Swallowtail Butterflies. One Session: Friday, April 26, 9:00 -10:30 a.m.
Laurice Hohlt has been hatching butterflies for many years. She has taught her methods several times and has been able to show how easy it is. Mutual funds? ETFs? What are they? How do they work? And what do you need to know about them to invest wisely? John Fiege will review how mutual funds and ETFs work, along with their pros and cons. He will include a question and answer period on any financial planning questions you might have, no matter the topic. One Session: Friday, May 3, 9:00-10:30 a.m.
John Fiege is a NAPFA-registered, CERTIFIED FINANCIAL PLANNER ™ and a registered member of NAPFA, which is the group for fee-only advisors. He is active in the Eastern Shore community. 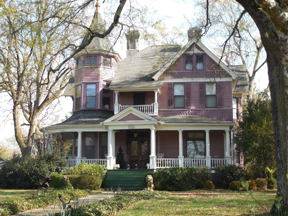 Lovers of Victorian architecture can find examples of this distinctive style all over Virginia’s Eastern Shore. Some have already been lovingly restored; some are still waiting for the right person to come along and return them to their full glory. This will be a discussion of the many types of Victorian homes on the Shore and the features such as gingerbread and porches that define them. One Session: Friday, March 15, 9:00-10:30 a.m.
Cathy Tignor has been a Realtor on the Shore for thirty years. She taught real estate courses at ESCC for many years and lectures to other Realtors on the architecture of the Shore. Adopted by the United Nations in 1948, the Universal Declaration of Human Rights is as relevant today as it was over half a century ago. The Universal Declaration of Human Rights was adopted by the United Nations in 1948. While the resolutions are not binding, they have been the basis for treaties, human rights documents, national constitutions and other laws. Anne Herdt will present information on the origins and meaning of the document. Students will be encouraged to discuss the personal and global implications of human rights. Four Sessions: Fridays, April 5, 12, 19, and 26, 9:00-10:30 a.m.
Anne Herdt represented a non-governmental organization at the United Nations in Geneva for 30 years. She was an active participant in the planning of the NGO Forums in Nairobi and in Beijing. Participate in an active, creative way to unlock the wisdom of your body and experience the integration of mind, body, heart, and spirit.. You’ll learn how to use your body wisdom to reduce stress and discover your hidden resources. Anybody can do it; all you need is a little willingness. This class is all about having fun and making things up on the spot! We’ll be guided to easily improvise and create art, using movement, stillness, storytelling, and voice and using a myriad of configurations. Expect to laugh, relax, and marvel at yourself and the natural body wisdom you have. No experience necessary. Note: Students should wear loose, comfortable clothing, such as gym clothes. Four Sessions: Fridays, March 8, 15, 22, and 29, 2:00-3:30 p.m.
Karen Hatch has been leading improv classes for two years as a Certified InterPlay leader, and has been affiliated with this international organization for seven years as a student and participant. She belongs to core groups in Washington, DC and North Carolina. 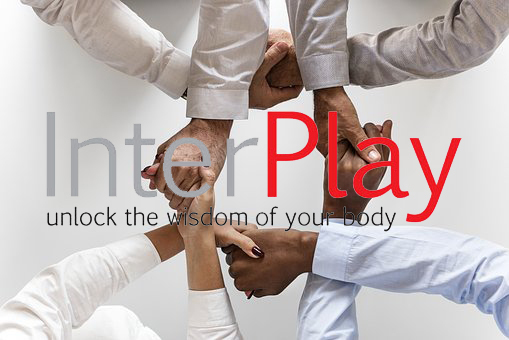 www.interplay.org. She is currently a student at Eastern Mennonite University and loves to “play” with people of all ages. Nothing as huge as the Medicare program can be simple. Jan Andrejco’s knowledge of the system has been hard won through personal experience. Let her give you a head start in finding your own way through the maze of regulations and options. Whether you are transitioning to Medicare this year, helping someone with Medicare decisions, or are already on Medicare, you will find something helpful in this seminar. Session one: there will be a clear explanation of Medicare insurance terms; the Supplement choices that are available to you; and knowing how to find the most economical policy for YOU. Session two: Jan will offer individual times to meet and help you understand what policies you have and/or to help you figure out what you really want. There will be no promotion of any insurance at either session. Session One: Friday, March 1, 12:30-2:30 p.m.
Jan Andrejco has been working her way through the Medicare maze for eight years when she started helping her mother. She is not an insurance agent, and there will be NO promotion of any insurance products. 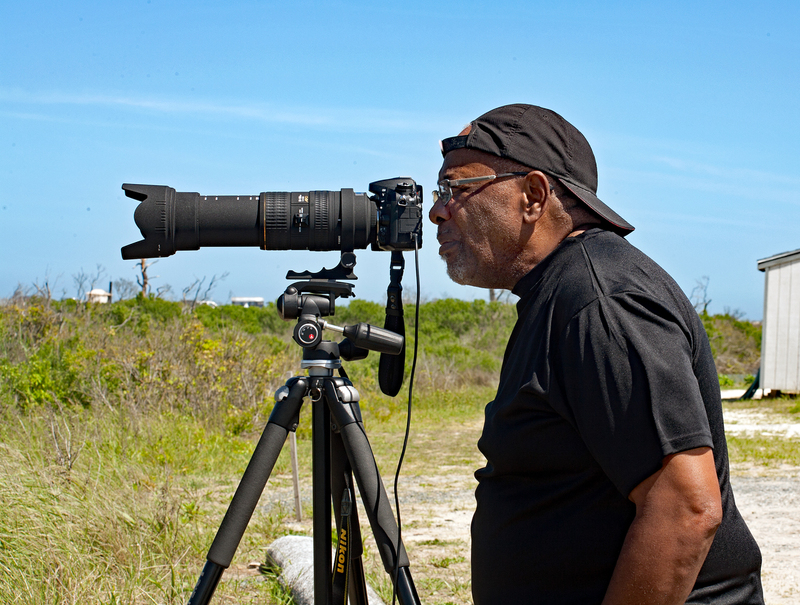 A field trip to Chincoteague National Wildlife Refuge gives class members a chance to practice the skills they’ve learned in the classroom portion of Nature Photography Workshop. The class will present approaches for landscape and wildlife photography. It is best suited to those who use a DSLR or a mirrorless camera. Advanced photographic methods will be presented, including shooting in manual modes and photographing birds in flight. Some information to be presented will be updated from previous classes. Four Classroom Sessions at ESCC: Fridays, March 1, 8, (no class on March 15), 22 and 29, 9:00-10:30 a.m.
George Budd is a local nature photographer who also teaches nature photography. He makes frequent presentations on the subject and sells his work locally in the form of prints and greeting cards. This hands-on course is for you if you’ve figured out how to turn on your camera, but after that, things get murky. We’ll take some of the mystery out of those daunting buttons and dials and help you learn to use the menu (“My camera has a menu? I didn’t even know it served food!”). We’ll also share a few tips on how to take better photographs and introduce you to some of the many help resources that are available. Please note: The course is intended to teach you how to use your digital camera, but it will not cover cell phone or film photography. Beginning photographers can find themselves bewildered by the array of buttons, dials, and menu items on a new camera, whether it’s a basic point-and-shoot or something with a few more features. But once you learn a few basics, you can take great photos with even the simplest camera. It’s all in learning to take advantage of whatever features your camera has. Four Sessions: Fridays, April 26, May 3, (no class on May 10), 17, and 24, 11:00 a.m.-12:30 p.m.
Helen Putre has little formal training in photography, but she’s been playing with cameras since she was a teenager. She really began to be serious about photography several years ago when she inherited a fancy DSLR and didn’t know how to use it. She currently shoots with a Fuji mirrorless. Helen doesn’t claim to be an expert, but she enjoys sharing what she’s learned and helping others to expand their own photographic horizons. Susan Quigley was a public-school art teacher in Connecticut and has been taking pictures for more than thirty years, with some formal photographic education and lots of practical experience. She loves to share and help with the technical and the art portions of photography. The techniques learned in this class can be used not only to produce beautiful quilts such as the one shown here, but also to create other unique and beautiful items such as rugs, bags and wallets. 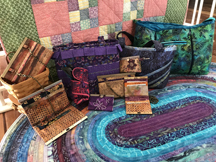 Five Sessions: Fridays, March 8, 15, 22, 29, and April 5, 9:00 a.m.-12:30 p.m.
Materials fee: $10 (payable to the instructor at the first class), which includes pattern and fabrics for samples. Kris T. Califano Hebert has been sewing for almost 50 years, quilting for 27. She has a degree from Florida State University in Fashion Design and Merchandising and also a Teaching Certificate in Human Sciences. Kris has been teaching sewing and quilting in Florida since 1988, ten of those years in her own store, The Quilting Patch, with three locations in Tallahassee and Jacksonville. Recently Kris relocated to the Eastern Shore and would like to continue sharing her love of sewing and quilting. In today’s world, we have unique opportunities to connect with others, while exploring new ways of seeing ourselves.Sharing ideas, and engaging in meaningful discussion, allows wonderful opportunities for growth and discovery. This will be an on-going study group with inspired conversation on themes of compassion, healing and boundless life. Books will be provided on loan and students will be requested to bring in their own favorite, relevant books and readings. Gentle yoga and meditation practice will be included. Four Sessions: Fridays, March 15, 22, April 19 at ESCC and May 10 at Linda’s home near Belle Haven, 1:00-2:30 p.m. Directions to Linda’s home will be given to participants after registration. Linda Lang designed and conducted the Smithsonian Yoga Symposia in 2014, 2017, and March 9, 2019: she is a member of the Advisory Council for the International Association of Yoga Therapists. 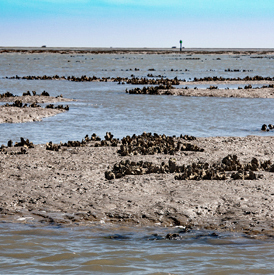 Exposed at low tide, at high tide oyster beds like these off the coast of Wachapreague are one part of a teeming undersea ecosystem. Their fate is dependent on the complex interrelationships among all parts of the system. This class will study the relationships between organisms and physical-chemical-biological factors of the marine environment, from open-ocean to coastal and estuarine ecosystems. Special consideration will be given to the biota of the Chesapeake Bay when applicable. In the four classes the participants will discuss: seagrass and kelp communities; coral reefs; the deep sea; productivity of the oceans; climate change; biodiversity; fisheries and food from the sea; marine conservation. Students need not have taken Part 1 of Ed Murdy’s Under the Sea class. Four Sessions: Fridays, March 1, 8, 15, (no class on March 22), and 29, 2:00-3:30 p.m.
Ed Murdy received a B.S. and a M.S. in Biology from Old Dominion University and a Ph.D. in Wildlife and Fisheries Sciences from Texas A&M University. He has 50 scientific publications, including four books, two of which deal with fishes of the Chesapeake Bay. He taught Marine Biology at George Washington University from 2009-2016. 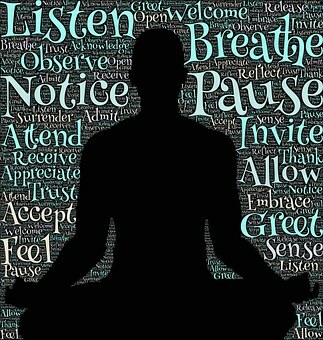 Learn to use yoga techniques and philosophy to relax your mind and body. This course is for newcomers to the discipline as well as seasoned practitioners. Are you new to Yoga? Or a seasoned Yogi? This class is for ALL! Anyone and everyone can do Yoga. Join us for a four-week series to explore Yoga postures and breathing techniques to bring strength, flexibility, and balance to body and mind. Each class will include a little Yogic philosophy and a period of stillness and deep relaxation. Come on out and celebrate Spring! Four Sessions: Fridays, March 29, April 5, 12, and 19, 11:00 a.m.-12:30 p.m.
Materials: A yoga mat or large towel. Wear loose, comfortable clothing. Toni Noreika has been a student of Yoga for 20 years. She is a Yoga Alliance registered Yoga teacher, a Reiki Master, an avid gardener, wannabe farmer, and enthusiastic cook. She moved to the Shore upon retiring from the Virginia Department of Forestry.